Health Canada should be talking to our nation's hemp farmers, helping them to start harvesting and using the valuable resins they're now throwing away. This is our best source for cheap and effective cannabis medicines, with whatever potency, cannabinoid mix and psychoactive effect desired. You won't believe the shocking waste of medical cannabis resin in Canada! When you think of cannabis resin, you probably think of sticky marijuana buds, or chunks of fine hashish. But did you know that almost all of Canada's cannabis resin is being grown by hemp farmers? Even more shockingly, they throw it all away! 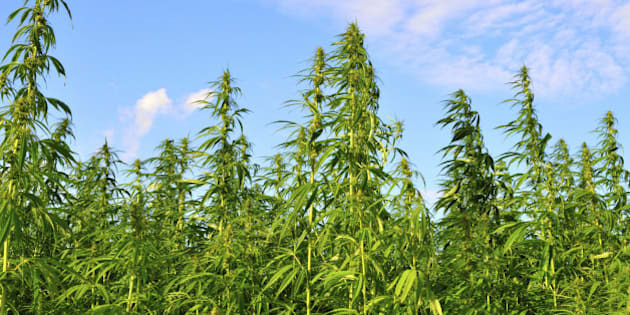 In 2013, Canadian farmers grew about 27,000 hectares (66,700 acres) of cannabis hemp for seed. These fields of female "hemp" plants look just like "marijuana" with big, sticky, resinous buds. In fact, "hemp" plants can produce just as much resin as "marijuana" plants. It's true that hemp resin is low in psychoactive THC, but it's still rich in CBD and other medicinal cannabinoids. Like THC, CBD is a cannabinoid with many medicinal benefits, but unlike THC it doesn't really get you high. The benefits of CBD have only become known fairly recently, and now many marijuana breeders are working to produce high CBD strains, by crossing "hemp" strains with "marijuana" strains. Their goal is to produce marijuana-type plants that make CBD instead of THC. When marijuana is grown indoors, male plants are culled, and only the resin-bearing female plants are allowed to grow. This maximizes resin production as the unfertilized female plants do not use any energy to make seeds. When the female cannabis plants are grown outdoors for seed production, they are fertilized by male pollen. Yet even when full of seeds, the plants still keep producing resin, albeit less then when they are left unfertilized. What all this means is that Canada's hemp fields are also producing a lot of CBD-rich resin, even though the farmers are only harvesting the seeds. Sadly, our hemp farmers are forbidden by law from saving or using any of the resins their plants produce. During harvest, the seeds are removed from the resinous flower heads, which are then mulched back into the soil or otherwise disposed of. So that 27,000 hectares of cannabis grown last year, how much resin did it produce? It's tricky to estimate, but we can make a pretty good guess. According to the United Nations, Afghan cannabis farmers get a yield of about 145 kilos of resin per hectare of cannabis. However, they're not growing seeded plants, and so their resin yields are higher than what we'd get for our seeded hemp in Canada. Morocco is a better comparison, because there the farmers don't bother to separate the male and female plants, and so they use seeded buds to make hash. According to the UN, Moroccan farmers get a yield of about 40 kilos of resin per hectare. If we assume that the seeded Canadian cannabis would yield the same as Moroccan, then 27,000 hectares times 40 kilos comes to just over a million kilos of resin. A billion grams of cannabis resin -- that's what our farmers are throwing away each year! Let's compare that million kilos of hemp resin with Canada's indoor marijuana harvest. Canada's total annual marijuana consumption has been estimated at 770,000 kg, but let's assume that's too low, and round up to a million kilos of cannabis being smoked across the country each year. With a 20 per cent resin content, that comes to 200,000 kilos of resin, less than a fifth of what is being thrown away by our hemp farmers! For Canadians growing indoors, a typical good yield is around 500g of dried cannabis under a 1000W light. If dried bud is 20 per cent resin by weight, then that comes to about 100g of resin per 1000W light. A good "perpetual harvest" system can bring in five crops a year. So if the math I've just scrawled on a pack of rolling papers if correct, we're looking at a two million lights using two gigawatts of electricity just to match the current resin production of our hemp seed farmers! So what if this outdoor hemp resin is mostly CBD, while the indoor-grown marijuana resin is mostly THC? They're actually very similar molecules, and it's easy to convert one cannabinoid into another with simple chemistry. Once you've got a few thousand kilos of resin to work with, CBD can be converted into THC, or any other cannabinoid you choose, at a very low cost. Now to be fair, the outdoor hemp resin has about four to eight per cent CBD, compared to around 15-20 per cent THC in indoor bud. But even if we compare cannabinoids instead of resin, we find that our hemp farmers are producing roughly 60,000 kilos of CBD currently being grown outdoors, compared to about 35,000 kilos of THC being produced indoors. As to an appropriate price for farmers to sell all that resin? Well, a hemp seed farmer can expect a yield of around two tonnes of seeds per hectare, which sells for around $1,000 a tonne. To match that, and double the total value of their cannabis crop, the farmer could happily sell resin for $50/kilo, bringing in another $2,000 per hectare with a 40 kilo yield. Heck, let's give the farmer $100 per kilo, tripling the value of his hemp crop! This still brings us farmer-fresh resin for 10 cents a gram. If that outdoor resin is about six per cent CBD, then we've got a wholesale price of $1.60 a gram for pure CBD, which should generate a retail price around $5 a gram. Compare this to buying CBD while it is still in a bud. Buds from a high-CBD strain like Cannatonic or Charlotte's Wed will have no more than 20 per cent CBD, usually less. At the current wholesale price of around $3.50 a gram, that comes to $17.50 wholesale for a gram of CBD in bud form, more than 10x the price of the outdoor product! Also, with a complete repeal of cannabis prohibition, why wouldn't farmers be allowed to grow high-THC strains on their land? Some farmers could choose to cull their male plants, and focus on growing only for resin without making seeds. In this case, resin yields could be three to four times higher, up to the levels of Afghani cannabis farmers. The cannabinoid profile could be much higher too, so the overall CBD or THC production could be 10 times higher per hectare. This could drop the wholesale price even more substantially, and still leave the farmer with the same profit. With all this in mind, I don't think Health Canada should be encouraging medpot entrepreneurs to invest millions in high-tech indoor facilities, focused on growing raw buds for patients to burn and inhale. Once we have the full and complete repeal of cannabis prohibition, these indoor operations will no longer be necessary or profitable. Instead, Health Canada should be talking to our nation's hemp farmers, helping them to start harvesting and using the valuable resins they're now throwing away. This is our best source for cheap and effective cannabis medicines, with whatever potency, cannabinoid mix and psychoactive effect desired. Once cannabis resin can be legally harvested from farmers' fields, indoor cannabis growing will virtually disappear, become only a niche industry. With a wholesale cost of under $2 a gram for pure THC or CBD, indoor growing couldn't compete. The only joint-smokers left would be those willing to pay extra for the privilege of using raw buds instead of pure extracts. With thanks to Prof. Jonathan Page, PhD, from the UBC Botany Department, for guidance and assistance with this article.